I had heard a lot about S. Hussain Zaidi’s writing but had never read anything by the man. I do not know why. Perhaps, there was always this perception that maybe the writing will not live up to my expectations as a reader or maybe I would not enjoy knowing about the Bombay Underworld and about the other world, so to say. 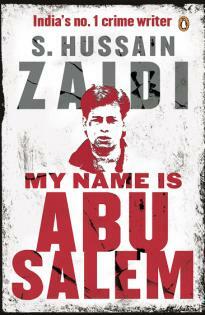 But I was proved wrong the minute I picked up, “My Name is Abu Salem”, the latest by journalist and writer, S. Hussain Zaidi. Going by the title, the book is about the life of Abu Salem and let me tell you that while it does scare you as a reader to know what kind of people exist in the world, it also makes you hate the man a lot more. I mean, I can never imagine having any empathy for a man who killed people at will, who had not the slightest remorse at how he behaved and to top it considered himself to be the lord and master of everyone influential who did and did not come his way. Zaidi’s writing style makes the book one breezy read and also makes you think about the situations (right time, right person) in which Salem grew to become an underworld don – a boy from a small town of Azamgarh to becoming one of Mumbai’s most feared Don, the one who only wanted fame, name and glory and perhaps still does. For most part of the book, I just kept wondering: How people lead such lives? Salem had bedded a beauty-queen who then became a film-star, he had every woman he could and wanted, he never cared about his wife Sameera and his son Amir and of course the core of it all – the crimes committed by him and his men. In all of this, I could not stop thinking of the effect a man has and the control he commands. Abu Salem’s personality went beyond who he was and maybe that was another factor that added to his aura. There are times while reading the book, you do feel that Zaidi is not revealing or telling all, but I think it has to do only with about whom he is writing. At the same time, he is just skimming through some parts, like Salem’s formative years. Zaidi does mention the main parts and there is a lot of information which otherwise no reader would know, like Sameera’s interview transcription on what was it like being Salem’s wife for ten years or Monica Bedi’s confusion when it came to him or for that matter the way Bollywood and the construction industry perceived him. The book obviously ends open-endedly because no one knows what will happen next in Salem’s life, given that he was sent from Portugal to India and that is how the Indian Government was able to nab him. And in more than one way, that is how the “downfall of the Don” began. “My Name is Abu Salem” is a fast-paced read with a style of writing that does not once bore you or make you leave the book. This entry was posted in biography, Books, Crime, Non-Fiction, Penguin Books, penguin india, Review and tagged Abu Salem, Biographies and Autobiographies, crime, Dawood, Don, Monica Bedi, Mumbai Bomb Blasts 1993, Mumbai Underworld, Non-fiction, Organized Crime, penguin books, S Hussain Zaidi on November 30, 2014 by thehungryreader. It was an evening of fun. It was an evening of telling stories, of listening to stories and it was about the Gaysi Zine and the launch of their 3rd edition in Mumbai. I think more than anything else it was about solidarity, of the community being represented by its voices and their stories to tell. I never thought I would be a part of the zine and write for it, but when Priya asked me to, I was more than eager to and so somewhere in the zine is my piece as well. Now to talk about the zine. This zine is perhaps like none other than you would have seen or read. The Gaysi Zine – 3rd Edition is fantastic. It has stories, it has visuals, it has a world that is marginalized and voices that will be heard, no matter what. I remember holding the Zine for the first time in my hand and being all ecstatic, well perhaps because I wrote for it, but also because it seemed monumental to me and not because I am Gay, but because it breaks boundaries and barriers in so many ways. The pieces are all in black and white, in fact the entire edition is in black and white and that is what makes it even more special. Emotions are always black and white I guess, maybe that’s why the context. 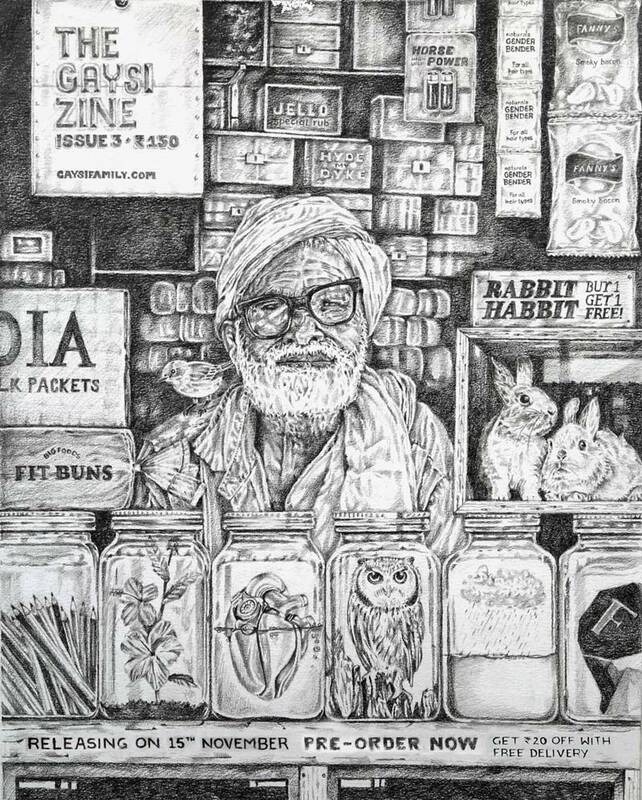 The Gaysi designer and the person who sketched this entire edition by hand gets more than a kudos from me – a big giant hug for when we meet. Now to the content: my favourite pieces in the Zine are: 1000 Days to Love, Letters in Monsoon, Rosabel and States of Arousal. These connected to me like no other pieces. Let me also tell you something: Emotions thankfully have no gender and neither do voices. They aren’t queer or straight or transgendered. They are there. Waiting to be acknowledged and to be loved. The Gaysi Zine Issue 3 is something else. It is a labor of love. 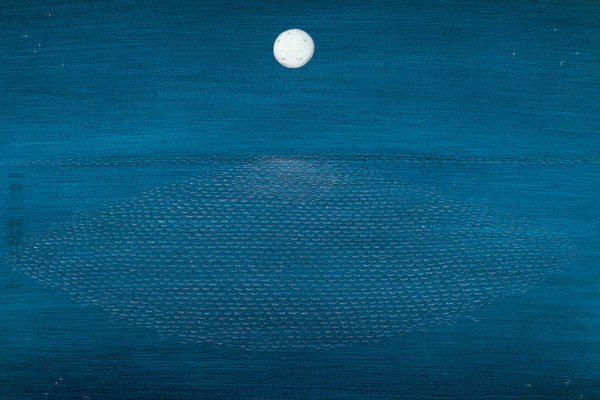 It is voices merged. It is a Zine which you should not miss. A universal language of love, according to me. This entry was posted in Books and tagged Gaysi Media, LGBT Community, queer, The Gaysi Zine on November 25, 2014 by thehungryreader. Not all good novels have to be long. There are times when you read a book and wish it was not that short. 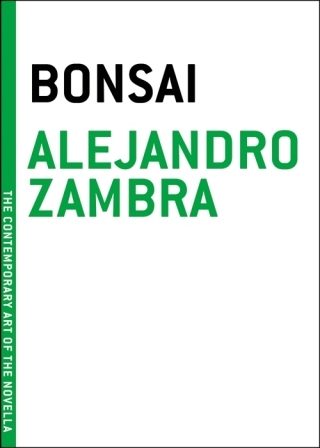 I have read “Bonsai” by Alejandro Zambra a couple of times. This was another time that I had to re-read it. “Bonsai” is a love story. It is a story on art and life. It is about life and its misery. It is also about how one can live and how one does. Alejandro Zambra’s debut novel (or actually a novella) is profound and yet funny in some parts. It is a story that is meant to be simple and ends up being extremely complex. Julio and Emilia are two Chilean university students. Julio loves Emilia. Emilia loves Julio. They both are avid readers. They lie to each other about having read Proust. They read in bed. They are grand when it comes to love and also doubtful and unsure about their love. They drift apart. Emilia then disappears from Chile without a word and that is when the story begins, merging the past and the present. There is also another story within this story and one more which will leave the readers spellbound. Bonsai of course does have a major role to play in the book and that I will not speak about in my review. Each word is essential. Everything is in place. The writing is accessible. It is melancholic and superlative. This is the kind of book that shows you that you do not need too many words to say what you want to. The tragic end of the story and the way it begins is enough for the reader to know that he or she is sold. The book is edgy, will be a treat for literary lovers and for those who want to explore the different side of fiction. This entry was posted in Books, Literary Fiction, Melville House, Novella, Review and tagged Alejandro Zambra, Bonsai, Chile, Chilean, Latin American, Melville House Publishing, New Mexico on November 2, 2014 by thehungryreader. “The Little Prince” somehow makes it to some list or the other. It is also almost every reader’s most beloved classic. It is fondly remembered by both – the young and the old. What makes it so special? Why does the world recommend it to be read? The magic lies not only in its plot but also in the way it was written and illustrated by Antoine De Saint-Exupery. 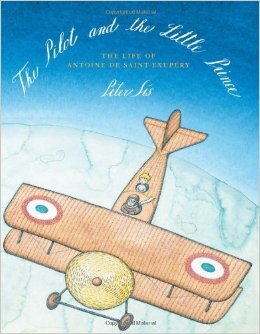 I did not know much about Saint-Exupery while reading “The Little Prince” or even after that, till I bumped into “The Pilot and the Little Prince” by Peter Sis online and knew that I had to own this book. 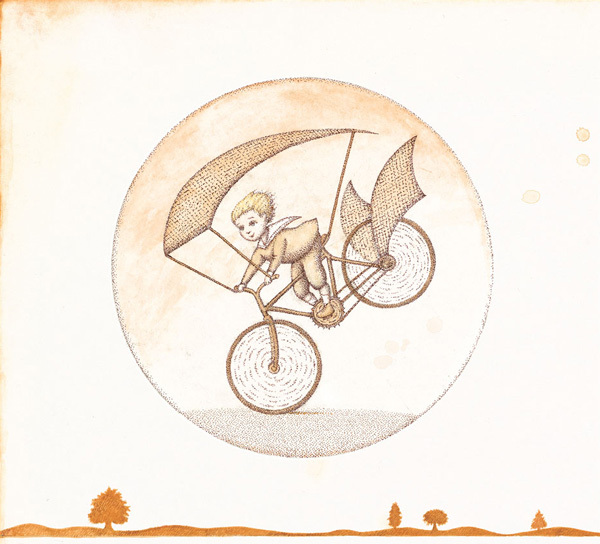 “The Pilot and the Little Prince” is about Antoine De Saint-Exupery, who was born in 1900, at the turn of the century when everything was new and progressing. Everything was developing. The world was in constant change mode and full of new inventions and technology, not to forget the most important invention of them all – airplanes. 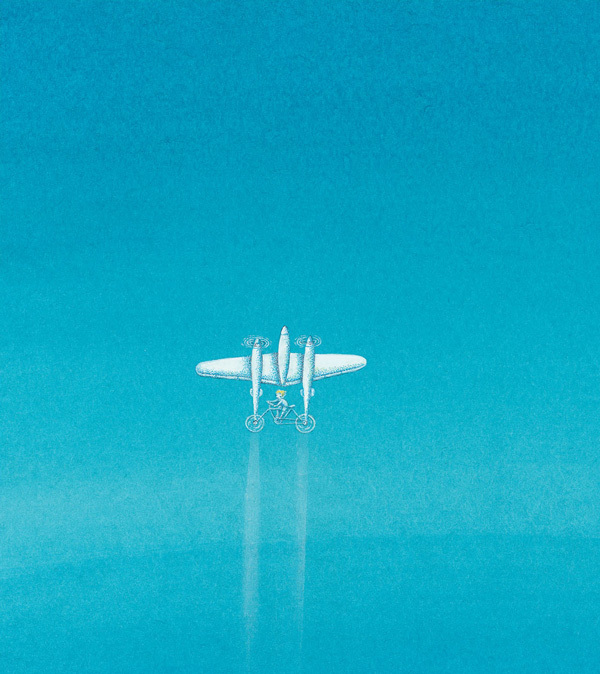 Saint-Exupery always dreamed of flying, far and wide and beyond everything else. So much so that he learned how to fly against his mother’s wishes and decided that all he wanted to do was fly. So much so that he would even tie cloth to his bicycle in the hope of it flying someday. The book is about a man’s discovery of who he wanted to be and what it sometimes takes to be who you want to be. “The Pilot and the Little Prince” juxtaposes the lives of both, Antoine and the little prince and how he got to writing this book. What is also most surprising is that this was not his first book (contrary to popular belief) and also the fact that his other works are equally good if not more. What struck me most about the book is the way Peter Sis has encapsulated his life in forty-eight pages. Page after page, the reader is treated to the blue of the ocean, to the glow of the sky and also to the blood of the German’s assault on France in WWII, where Antoine was enlisted as a war pilot. From his plane, he reflected on life and what lay before him. He thought of things magical and life that went beyond the ordinary. Antoine also read books on his plane. He just wanted to fly and write about his experiences and in 1943 of course his masterpiece, which we all know as “The Little Prince” was published. On July 31, 1944 he took off for a flight to photograph enemy positions east of Lyon and never returned. That was the end of a writer, an aviator and a human being who only wanted to talk about what he saw and observed. 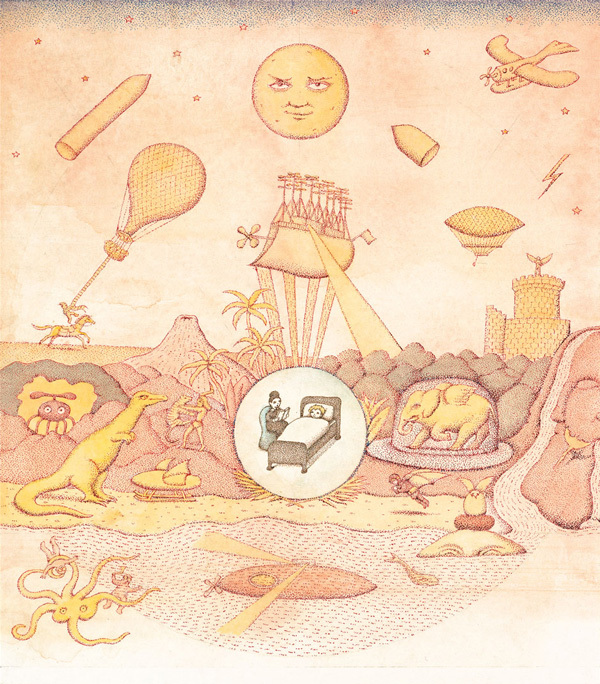 “The Pilot and the Little Prince” is a delightful book. It is brief, beautifully illustrated and yet takes a lot of time to read through and sink in the marvelous illustrations. This is a book meant for both children and adults. It is the kind of book that will warm your heart and yet leave you melancholic. This entry was posted in biography, Books, Children's Books, FSG Originals, November 2014 Reads, Review and tagged Airplanes, Antoine De Saint-Exupery, Biographies, Children's Books, Farrar Straus Giroux, france, French Aviator, Illustrations, November 2014 Reads, Peter Sis, spain, The Little Prince, The Pilot and the Little Prince, world war II on November 1, 2014 by thehungryreader.